This Certificate Authority [CA] & Public Key Infrastructure [PKI] solution helps the mobile operator, and service provider, leverage the mobile phone SIM cards into the area of identity and digital signatures. Using Digi-CA™ Wireless Public Key Infrastructure [WPKI], turns the mobile handset into an identity token and a digital signature device that can be used with a host of mobile applications. The Digi-CA™ WPKI system can be delivered as a Managed CA service or as an installed Software CA. It can serve a few hundred users, to begin with, and can be scaled (with minimal, if any, service interruption) to a large deployment serving millions of users. In co-operation with our wireless technology partners that are members of our ARP Network, the deployment of the Digi-CA™ WPKI certificates and signatures from the RAMC can be partially/completely automated, as required. To enable the wireless component on the Digi-CA™ PKI system, a Mobile Signature Service Platform [MSSP] is added. By combining the Digi-CA™ and the MSSP, these two systems integrate seamlessly to provide a WPKI. 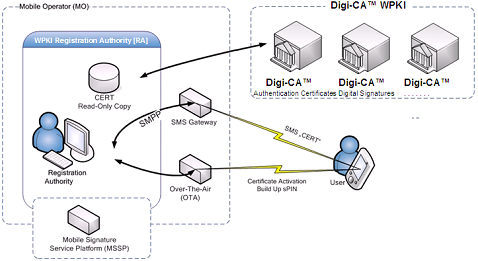 The following schematic explains the function and location of the Digi-CA™ PKI system and the MSSP.